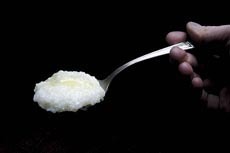 The Part Time Gourmet: Trendy Food of 2006 - Grits? Elizabeth Downer of the Pittsburgh Post-Gazette lists out grits as one of the hot food trends of this year. While grits have been a staple in the South for more than 200 years, they haven't been all that popular to the North. She says that they are now being used by chefs all over the country to create comfort foods. My best friend's father grew up in Georgia, and he used to make us cheese grits on a weekend morning. That was some seriously good stuff, I'm tellin' ya. Here are a couple of receipes from the article which are likely close to that great breakfast item that I haven't had in over 10 years now. I sometimes vary the original recipe by using shredded Monterey Jack cheese with jalapeno chilies. This is especially good as an entree side dish. Recipe can be doubled. Preheat oven to 350 degrees. Cook grits according to directions on box. Stir in cheese, eggs and milk. Pour into buttered 2-quart baking dish. Bake one hour or until set. Sunday morning breakfast at my grandmother's house frequently featured fried grits. Prepare the grits according to directions on the box using 1/2 cup of dry grits and the prescribed amount of water. Pour the cooked grits into a loaf pan, cover with plastic wrap and refrigerate overnight. Slice the cold grits at 1/2-inch intervals and dip into seasoned flour, egg and then cracker crumbs. Fry in butter and serve with fried, poached or scrambled eggs.